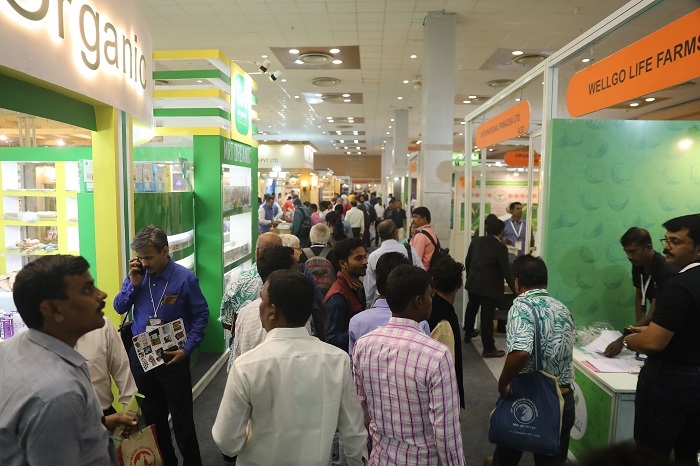 The ninth edition of BIOFACH INDIA together with INDIA ORGANIC 2017 concluded at India Expo Mart Limited (IEML), Greater Noida, Delhi-NCR on 11 November 2017 with a resounding success. The three-day exhibition witnessed an overwhelming response from around 10000 visitors which included trade visitors, delegates as well as farmer groups from India and all over the world. For the first time this year the event was held concurrent to the 19th Organic World Congress (OWC) of IFOAM Organics International, a global event dealing exclusively with organic farming focused on the theme: “An Organic World through an Organic India”. Shri. Ram Nath Kovind, Honourable President of India congratulated the organizers and participants and stressed the importance of turning organic. In a message to the Organic Farming Association of India (OFAI), the principal host of the OWC, the Honourable Prime Minister of India, Shri. Narendra Modi expressed his happiness at India being chosen to hold this mega event and stated, “This meeting will enable global organic farming movement leaders and all its stakeholders to deliberate on key issues of the sector.” He concluded by sending his best wishes for the success of the event and for the global organic farming movement to help the world in achieving the true meaning of sustainable development. The Organic World Congress along with BIOFACH INDIA was inaugurated by Shri Radha Mohan Singh, Honourable Minister for Agriculture and Farmer’s Welfare, Government of India on 9th of November at India Expo Mart Limited (IEML), Greater Noida, Delhi- NCR, India. Other eminent dignitaries present at the inauguration included Shri Pawan Chamling, Honourable Chief Minister of Sikkim, Shri. Surya Pratap Shahi, Minister of Agriculture, Uttar Pradesh, Smt. Menaka Gandhi, Union Minister for Women and Child Welfare, Govt. of India, Shri. V.S. Sunil Kumar, Minister of Agriculture, Govt. of Kerala, Mr. Na Yong Chan, Mayor of Goesan County, South Korea, Shri. Ashish Bahuguna, Chairman, Food and Safety Standards Authority of India (FSSAI), Shri. Somnath Poudyal, Honourable Minister for Food Security and Agriculture Development, Govt. of Sikkim, Shri. Devendra Kumar Singh, Chairman, Agricultural and Processed Food Products Export Development Authority (APEDA), Smt. Rita Teaotia, Secretary Commerce, Ministry of Commerce and Industry, Shri. Jagdish Prasad Meena, Secretary, Ministry of Food Processing Industries and many others. Trade Fair: The event witnessed successful participation by 184 exhibitors from India and all over the world. The exhibitors included Private Stakeholders, State Pavilions, Government Boards as well as key Certification Bodies who exhibited a diverse range of food and non-food organic products. Some of the leading organizations at the trade fair included names like: Brahm Arpan, MRT Organics, Suminter India Organics, Phalada Agro, Just Organik, Radico, Mehrotra Consumer Products, Agronic Food, Sarveshwar Foods, Natureland Organic, Cultivator Natural Products, Samruddhi Organic Farms, Kejriwal Bee Care, Capital Ventures, Organic India, Fishfa Biogenics, Geo-Fresh Organics, Rapid Organic and many more. The participating States included Sikkim, Andhra Pradesh, Kerala, Bihar, Meghalaya, Karnataka, Tripura, Chattisgarh, Assam, Uttarakhand, Manipur, Nagaland, Telangana, Uttar Pradesh, Punjab and Arunachal Pradesh. International Buyer’s Delegation BIOFACH INDIA/OWC was a great forum for the Indian exhibiting companies to showcase their wide range of organic produce to international clients. There were around 50 international buyers from Germany, Netherlands, Italy, France, USA, Canada, Indonesia, Turkey, Middle-East, China and South Korea who visited the event so as to specifically extend their network and develop new procurement sources. High quality Conference Program – On the knowledge and education side, an international conference was held to deliberate on the current practices/trends/challenges faced by the organic sector with eminent key national and international speakers from relevant industry. Attendance by 2479 delegates from 90 countries was witnessed over the period of 3 days. Hands on Demonstration by Farmers – For the first time this year the event was a meeting place for organic farmers from across the world. The interactions led to a massive exchange of organic agriculture innovations and advanced organic techniques. National Level Organic Seed Exhibition – The Seed Festival was organized by the Bharat Beej Swaraj Manch, along with Sahaja Samrudha and Save Our Rice Campaign as a parallel event during BIOFACH INDIA/OWC. Over 4,000 different varieties of seeds were on display, along with relevant posters and literature. The organic food market in India is projected to register growth at a CAGR of over 25% during 2015-20. India’s organic food market has potential to grow more than 25 percent annually to touch $1.36 billion by 2020. The market is growing at 25-30 percent at present. More growth is expected in future as the government is increasingly supporting organic farming in the form of subsidies and is also planning to roll out a comprehensive policy in this regard. As per the government data, organic farming is practised in 12 states in about 4.72 million hectares. Tarun Prajapati, Cultivator Natural Products Pvt. Ltd.
NürnbergMesse Group is one of the 15 largest exhibition companies in the world and among the Top Ten in Europe. The portfolio covers some 120 national and international exhibitions and congresses and approx. 40 sponsored pavilions at the Nürnberg location and worldwide. Every year, around 30,000 exhibitors (international share: 39%) and up to 1.4 million visitors (international share of trade visitors: 22%) participate in the own, partner and guest events of the NürnbergMesse Group, which is present with subsidiaries in China, North America, Brazil, Italy and now also India. The group also has a network of about 50 representatives operating in approx. 100 countries. ICCOA – International Competence Centre for Organic Agriculture started as a knowledge centre for all stakeholders involved in the organic sector and was registered as a society in 2004. Today, it works in 12 states of India reaching out to around 270 member organisations and more than 2 lac farmers directly and indirectly. The organisation collaborates and networks with individuals, farmer organisations, consumer organisations, voluntary organisations, corporate bodies, research institutions and government departments in India and South Asia. BIOFACH World has proven expertise in the area of organic food. The international organic industry meets every year in Nuremberg at BIOFACH, the World’s Leading Trade Fair for Organic Food. BIOFACH World is represented across the globe by five other BIOFACH events in Japan, the United States, South America, China and India, and brings over 3,000 exhibitors and 100,000 trade visitors together year after year.